I really must sit down one day and devote some time to my poor *new* vampire blog that I started last year. I say *new* cause some of you might remember my old vampire review blog Alucard's Rose. Which I ran for almost 3 years. And you are thinking why did I stop and why did I create a new one? Well, I stopped because I thought I was moving on from that area of my life. And I created a new one because I had started to miss it. Well Spudgun, it made sense to me at the time. A few of the books I have on the review pile are vampire books, so I'm hoping to kick start the vampire blog again in a few weeks time when I review those books. Makes sense. In the meantime Spudgun (and Spuddy) I still have not found my Fright-Rags shirt. (for the vampire movie Fright Night) It's still missing somewhere in this apartment. Damn, that was a cool shirt! 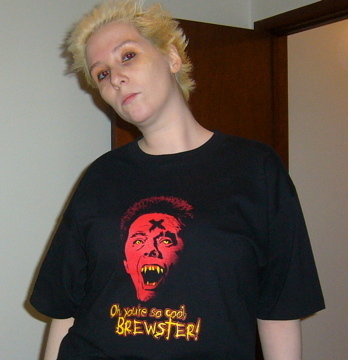 (me in 2007) and Damn, that was a great hair dye. I just can not seem to get my mop to do that anymore. I'm still on the red-side no matter what bleaching kit I use it just does not seem to want to work. I swear, the universe want's me a redhead. Much to my own horror. Yes I know, when it comes to my hair I have a Billy Idol obsession going.